Bluegrass mandolin player, Grammy and IBMA award winner Mike Compton has been confirmed as a headline act for MountainGrass 2016. Mike Compton has become one of the most influential mandolin players in acoustic music today. His personal contribution as performer and teacher has enriched and helped shape the emerging genres of both bluegrass and old-time music. Born in Jimmie Rodgers’ hometown of Meridian, Mississippi, Mike Compton was about 15 when he locked in on the mandolin. Everyone on his father’s side of the family had played music for generations. His mother’s grandfather played the violin but was gone before Mike ever had a chance to hear him play. However, his grandfather played guitar with a local fiddle hero which became the spark that would initially fire up Mike’s lifelong appetite for acoustic music. As a teenager, I got real interested in my lineage as my elders began to die out. Compton’s had lived in that area of the South for over 200 years – Mike Compton. Mike found that traditional music had been a mainstay in his family’s households as far back as anyone could remember. His mother, while not a musician, heartily encouraged Mike. His first guitar was a Yamaha FG-75. But once he received a Sears & Roebuck “Tater Bug” mandolin for his 15th birthday, he spent most of his time noodling away on that. When first heard the tunes of Bill Monroe, the Stanley Brothers, and Flatt and Scruggs, he thought bluegrass was the most wonderful stuff he had ever heard. He spent the next years learning to play those songs lick for lick. 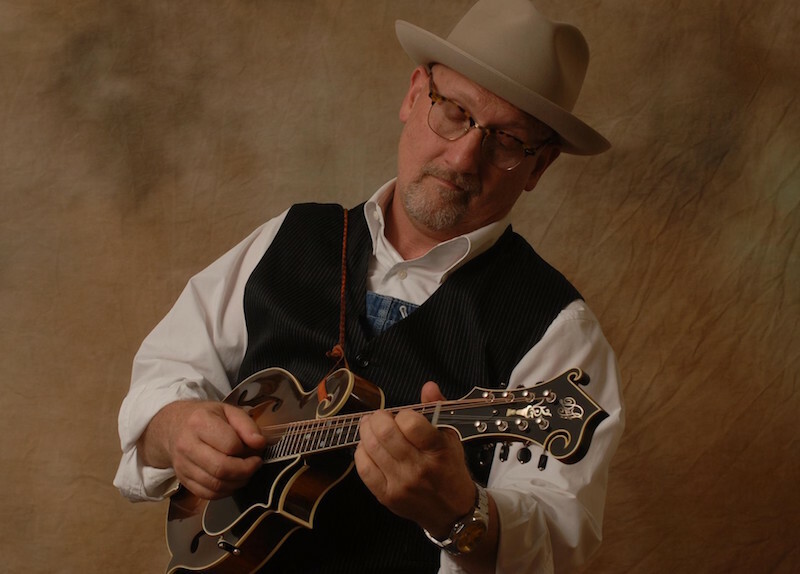 In 1984, when Pat Enright and Alan O’Bryant began to put together the Nashville Bluegrass Band, Mike Compton was their first choice on mandolin. The band was like a marriage made in heaven. Their blend of bluegrass, blues and traditional styles was an immediate hit and they had no trouble finding work. By late 1989 after a bus accident with the band Mike, presented an official resignation to the Nashville Bluegrass Band and moved to the Catskill Mountains. He spent a year there before realising how much a part of his heart music occupied. He hooked up again with guitarist David Grier (the two had recorded a duet CD in 1989, Climbing the Walls) and toured the U.S. and Japan. I met John Hartford up in Norris at the Tennessee Homecoming Festival in ’94. He had followed NBB and he said it struck him as good music. I spent a good deal of time with him up there, jammin’ with him, listening to him tell me how wonderful it was being a single act, how nothin’ could beat the freedom of that. He completely sold me on the benefits and virtues of working alone. Then he called me up the next day and offered me a job – Mike Compton. Mike became a sideman for John Hartford, with whom he performed until Hartford’s death in June 2001. Mike worked with other musicians during those years including David Grier, Chris Jones, Bill Evans, Keith Little and others. In 2000 was invited to play on a movie soundtrack that would ultimately sell over 7 million copies: O Brother, Where Art Thou? Mike Compton officially rejoined the Nashville Bluegrass Band in January 2000. The following year was a whirlwind. O Brother Where Art Thou? went platinum and waltzed away with the Best Bluegrass Album Grammy and IBMA’s Album of the Year. The Nashville Bluegrass Band joined the O Brother CD promotional tour that year, and in 2002 the follow-up Down From The Mountain tour. With NBB one of the acts, Mike played in the house band that backed up most of the performers. Today Mike travels the world playing the music he loves. He also gives private instruction in Monroe-style mandolin online, giving as many as 40 lessons in a week. He picks up fans and students wherever he goes – and his outreach is definitely going global. He spent six weeks in Australia early this past spring, his second visit in recent years. He lives in Inglewood, Tennessee, married to Hardanger fiddler and artist Sadie; they have two children, Hallie and Eli.